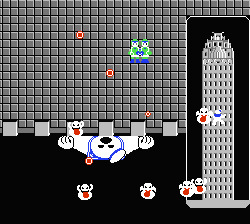 "Everyone knows that video games based on popular licenses are usually lackluster and best forgotten, but the NES port of Ghostbusters cleverly avoids sinking into that trap – no, it bravely charts a course towards its disastrous new low thanks to a triple threat of mind-numbing repetition, frequently nonexistent controls, and abysmal level design! It could have been mediocre. Mediocre would have been so much simpler. 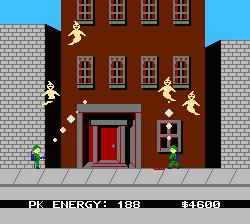 Everyone knows that video games based on popular licenses are usually lackluster and best forgotten, but the NES port of Ghostbusters cleverly avoids sinking into that trap – no, it bravely charts a course towards its disastrous new low thanks to a triple threat of mind-numbing repetition, frequently nonexistent controls, and abysmal level design. 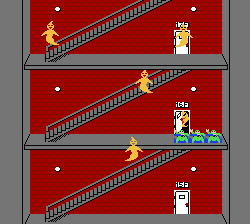 Believe it or not, this was once a halfway-decent Activision game on a bevy of platforms ranging from the Commodore 64 to the Atari 2600 before eventually falling into the hands of demented Japanese programmers who “improved” it for a 1986 Famicom release. Then an unsuspecting (okay, greedy) Activision brought it back to the States two years later; it made them quite a bit of money in years past, why not again for the ludicrously potent NES market? Oh, right – because this version would have been an embarrassment no matter what year it was. With that incredibly muffled and generally pathetic oration setting the tone for the rest of the game, you’ll find yourself on a large overhead map filled with narrow roads and drab-looking buildings, a half-hearted rendition of the movie’s theme droning on endlessly and pausing for only the briefest of seconds before it loops to torture you anew; you’d better get used to it, because it’s going to be your constant companion for the entire game. 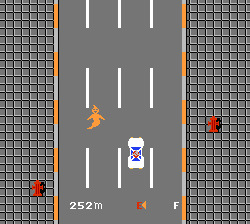 Assuming you lack the sense to simply quit now and save yourself a mountain of forthcoming grief, you’ll find that your Ghostbusters can’t get much of anything done without the proper equipment, so move your icon to the local Ghostbusting shop (try not to think about it, you’ll only hurt yourself) – the map gives way to a vertically-scrolling stretch of highway as you attempt to avoid oncoming traffic that I imagine are actually being overtaken but appear for all the world to be driving backwards. I say “attempt” because the vehicle controls terribly, making such exploits more a result of luck than of skill. Incidentally, you’ll also have to accomplish this at full speed, as otherwise you’ll run out of gas; thanks to a curious quirk the gas gauge decreases at a constant rate that’s oblivious to your actual speed, so forget about taking it slow or you’ll never make it in time. Oh, and whenever you hit another car (which you will, and often) you’ll lose some of that much-needed money. Once you’ve outfitted your team of ectoplasmic entrepreneurs with those everyday tools of the trade like capture beams and traps for spirit containment, you’re ready to join the exciting world of undead removal! In other words, moving across the map in search of haunted buildings that begin to flash as you move past them, catapulting you to another annoying road trip; the scene’s length depends on how much of the map you covered before finding one of these haunted locales. With that bit of nastiness completed, you’ll arrive at a bland sideview screen in front of the building currently being haunted by a number of specters lazily floating high above. To its credit, busting ghosts in the Nintendo port is incredibly easy; simply switch between your two characters to maneuver them beneath the ghosts and allow those errant specters to fly right into your rigid lasers. With the ghosts now affixed to your capture beams, you must return to your trap to swallow them up before time runs out. You can even aim diagonally to snare particularly frisky phantoms, but don’t get to close to your partner, as crossing the beams will tear asunder the fabric of the universe . . . well, actually it will send you hurtling back to the map screen. I know, I’m every bit as disappointed as you are. Of course, just because busting ghosts is easy doesn’t actually translate into it being particularly entertaining, but at least you won’t have any difficulty busting some heads – in a spiritual sense – and raking in some quick cash. So you’ll do it again . . .
. . . again . . .
Drive, bust, drive, bust, repeat as necessary. Occasionally you’ll have to make a pit stop to empty your ghost-laden traps or fill up on gas . . .
. . . and then you’ll do some more busting. After repeating this process for far too long, you should have enough money to upgrade your equipment with even longer hyper beams, a containment trap with unlimited storage, and a ghost alarm that lets you view the haunted buildings without having to touch them. Keep up this parade of the unbelievably dull long enough and the message “ENTER ZUUL BUILDING” will mercifully begin scrolling across the bottom of the screen. Could the end be at last in sight? If you’re to stand any chance of survival in the next portion of the game you’ll first need to purchase some very expensive equipment, and each time you snag one of these needed items your newly emptied back account will cause the invitation to disappear. Here we go again! Only when you’ve gathered all the equipment you need over an immeasurable length of time – in one sitting – are you ready to enter the hallowed halls of Zuul, and only then will you realize the cruel joke that’s been played on you. All of that tedious fundraising has been for naught – the building is nearly impossible, not the manly shooter sort of impossible but one born of the programmer’s outright incompetence and/or cruelty. In an obvious case of film-to-game accuracy gone horribly wrong, you’re expected to scale the building’s heights in order to reach the rooftop, proceeding higher and higher amid all 22 of the completely identical floors. Then again, the film didn’t feature a pack of ghosts descending on your team of three (why three?) as they madly scramble across yet another span of brick wall and up yet another flight of stairs through your furious blister-inducing pounding of the A button, so I guess it’s actually not that accurate after all. Wait . . . did I say “scramble?” I meant “plod.” Words cannot truly describe the sluggish pace of your heroes or their frequent stubborn refusals to begin climbing the stairs or even change directions; compounding matters is the fact that merely the slightest of brushes against your snail-like busters register as a hit; absorb three of these and your team hits the floor with a thud. Game Over. Unless you remembered to buy all of that wonderful equipment! Assuming you shelled out the spendola for a trusty Anti-Ghost suit, you can take nine hits instead of three. Dropping a bit of Ghost Food and beating a (relative) hasty retreat allows you to draw the hungry ghouls away from you, although you can only use it three times. And for the ghastly price of a Sound Generator you can slow down the spooks by a marginal amount. Thus properly equipped, your brave team will . . . well, they’ll still be annihilated, but it’ll take quite a bit longer before they’re destroyed. You’ll recognize the imminent arrival of this bitter end by the sound of your controller as it smacks into the wall with a wince-inducing crack and that sudden sensation of heat in your arms as shards of plastic embed themselves in your flesh. Not that that’s ever happened to me or anything. Assuming you actually make it to the top due to a stroke of amazing luck, an even more amazing hit-detection glitch (which did actually happen to me once) or an (ahem) “game-enhancing device”, you’ll battle the wicked Gozer on the final screen - an embarrassingly poor overhead shoot ‘em up which, driving the game’s continual theme home with all the force of a sledgehammer, is incredibly frustrating due to its stiff, unresponsive controls. Hurrah! But wait – now that I’ve described the game for you, you don’t even have to play it! The ending is practically nonexistent anyway (although it does include a hearty “CONGLATURATION”, which I suppose is worth something) so by all means imagine your own, possibly involving ninjas. Ninjas with, you know, shurikens or something. Those who enjoy crappy Nintendo games will think that Ghostbusters is the second coming, but everyone else will want to steer clear of this slimy 8-bit corpse. Just bury the wretched thing and let it rest in peace.